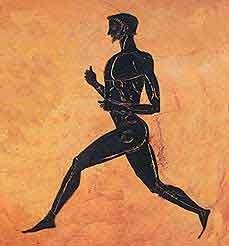 Pheidippides was a hero in Ancient Greece. It has been told that he ran from Marathon to Athens in under 36 hours to deliver the news of a military victory over the Persians to the magistrates who were anxious about the results of the battle. He delivered the news, then collapsed to his death. Whether this story is true, or merely a myth, is debatable. But you can’t argue with the fact that it touches us all. The story touched humanity so deeply, that we still honor it today in modern-day marathon running races. Why this story? What makes it so inspiring, moving, and haunting? Why would a story of an ordinary messenger, who died in order to bring good news, ignite a spark within? Of course. We love this story because it’s the story that’s told by every echo of our heartbeat. It’s the story that was knit into our soul before we were even born. It’s the story that we were born to hear and live to tell. It’s our story. It’s the story of how the good news came to us. Our Messenger gave His life so that we could hear the news of victory. The story is told that Pheidippides’ dying words were “Joy to you.” He spent his last breath to give joy. And isn’t that Jesus’ dying message, also? His death. For our Joy. His work. For our victory. His pain. For our peace. His distance. For our rest. And now. On this side of the finish line, the marathon continues until He returns. But this time we are the messengers. Running the race. And our message? Jesus. This time He IS the message. He is the Good News. Are you giving your life to deliver Him? So that others may know? I’m linking this post up with other writers who are joining in with Five Minute Friday. We write on a one-word prompt for five minutes…then post. It’s a fun challenge!